Established in 1980 by John Farmer, the firm has been serving the musical needs of churches and schools in the southeastern United States for over the past 30 years. Our workshop, a handsome post and beam style building in the woodlands of the Piedmont, is located just outside of Winston-Salem, North Carolina. It provides an old-fashioned work environment for our dedicated group of skilled artisans, woodworkers, and organ technicians. Organ building has always been a team effort and we are fortunate to have a diverse cross section of creative and experienced people working in our shop. 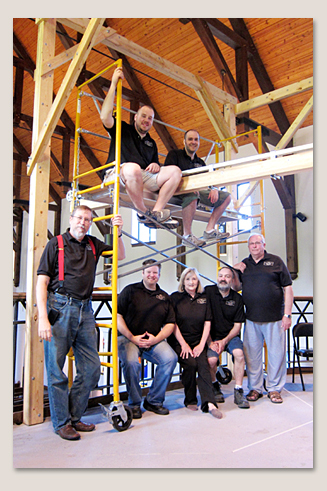 A few of our more well known projects include the relocation and restoration of the 1916 E. M. Skinner in the Great Banquet Hall at Biltmore Estate in Asheville, NC; the restoration of the oldest pipe organ in South Carolina, circa 1830, for Liberty Hill Presbyterian Church; a new all mechanical instrument in Memorial Chapel of First Presbyterian Church, Greensboro NC; and more recently, the rebuilding of the historic 4 manual Austin console for Centenary United Methodist Church, Winston-Salem, NC. For the past fifteen years, we have also held the position of curator of the organs for University of North Carolina School of the Arts and Salem College. Currently, we are restoring, with some additions, an 1898, 3 manual, 40 stop Hook and Hastings instrument for St. Timothy’s Episcopal Church, Winston-Salem, NC. The Farmer shop has been featured in Southern Living magazine, The Diapason, Music, WFDD radio, as well as various other regional newspapers and music journals. © J. Allen Farmer, Inc 2015|ProPhoto4 Blog by NetRivet, Inc.